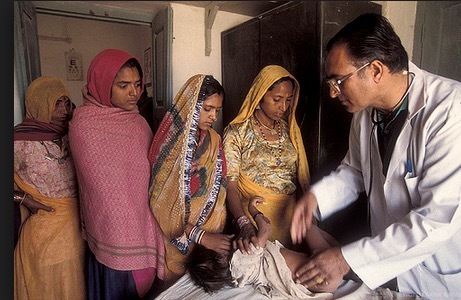 Can Open Health Data Promote Entrepreneurship and Innovation in India? There are a growing number of exciting opportunities to think about leveraging health data globally. Just imagine the possibilities when you bring open health data initiatives together with creative tech entrepreneurs across countries to address key health and health care issues. More solutions, greater global impact? This was a key area of exploration at the 2015 Health Datapalooza, and a special session featuring government representatives from India. Health Datapalooza welcomed a delegation from the Government of India (GOI), including two representatives from the Office of the Registrar General (ORG), Ministry of Home Affairs: Rohit Bhardwaj, Deputy Registrar General, and Rajeev Kumar, Deputy Director. Both participated in a panel titled, Using Open Data to Promote Entrepreneurship and Innovation in India, chaired by Indu Subaiya, Co-Chairman and CEO, Health 2.0. “India is poised for major growth in health IT innovation. We are excited to both share our experiences with open health data and learn from them as they leverage more than 900 million mobile phone users and a growing community of technology entrepreneurs,” said Susannah Fox, Chief Technology Officer of the Department of Health and Human Services (HHS). The session and follow-up roundtable discussion at the Health DataPalooza offered a useful exchange of experiences around open health data in the U.S. and India, and initial ideas around possible areas for collaboration. Indu Subaiya kicked things off with an overview of the open health data movement in the U.S. while Indian delegates explained the critical role of ORG in collecting national-level health and demographic data. ORG runs the Sample Registration System (SRS), a demographic survey with sample size of 8 million people and the Annual Health Survey (AHS), which collects data on 161 indicators from 25 million participants in 4.2 million households. AHS and SRS data are publicly available (at the district level) and are frequently utilized by other government ministries including the Ministry of Health and Family Welfare. Mr. Bhardwaj emphasized the potential for ORG data to identify key high and low performing regions in India for a number of health indicators such as infant mortality, fertility and immunizations. This information could be used to identify and target government resources on implementing programs in key regions that are likely to have the greatest health impact. Ramesh Kolluru, Vice President of Research at University of Louisiana at Lafayette and Rushika Fernandopulle, CEO of Iora Health, provided reactions and feedback to the ORG representatives. They talked about the potential of using competitions and hackathons to increase engagement by entrepreneurs in solving high-priority problems identified by the government; the power of mashing up population and clinical data for analysis; and the importance of turning data into actionable steps to improve health. Running a series of challenge competitions to engage entrepreneurs and/or talented university students in developing possible solutions to the challenges that were identified. These are just some of the initial possibilities that could be worked on between now and the Health 2.0 meeting in Hyderabad in December. As we stay tuned for the concrete work areas that the government of India representatives and other key stakeholders decide upon, one thing is clear – open health data is moving beyond our national boundaries more than ever before, and we are thrilled. Julie Schneider is the program lead for the HHS IDEA Lab’s Entrepreneur-in-Residence program, and is working on international collaborations related to open health data.